“When we first started having Lakefront,” said Linneman, “only people in Riverwest knew about it. People from the outside came in and tried it out, because that was the only beer we had, and they liked it.” Wine distributor Nate Norfolk recently bought a house on Fratney Steet, around the corner from the old brewery. He was already familiar with the good taste of Lakefront beers from his days at Downer Avenue Liquor on the East Side. Norfolk’s more of a wine drinker, but he makes an exception for Riverwest Stein. He’s bought three kegs of it just this summer. “All of their beers are subtle and balanced,” he said at a block party while one of those half barrels was being consumed. “Drinking a Stein is like smelling a woman who’s only a woman vs. one who just put on some cheap perfume. They know how to be distinctive without being overwhleming.” Jim and Russ made the rounds of the bars – sometimes for business, sometimes for pleasure, usually for both – and got to know most of the bar owners. “The guys who owned the bars,” explained Russ, “owned other nearby properties, too, so they wanted local industry to succeed, All these guys pushed my beer, and the people who came from other neighborhoods started drinking it.” During the early years of the brewery, Russ kept his day job as a battery engineer at Johnson Controls, and some of the marketing guys there gave him advice. “They told me, ‘You gotta take your beer downtown and get it into a cool night club. That’s the only way to make it.’” Indeed, Russ tried that at first, but the hip spots turned him down. “The neighborhood,” he said, “was the only place that served it and wanted it. And that turned out to be the best place to put it. We wouldn’t have lasted this long otherwise. 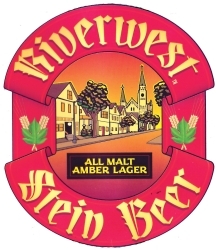 We couldn’t have done it without Riverwest.” Riverwest is still the home of their most loyal customers, and the original flavors – Riverwest Stein, Klisch Ale, and East Side Dark – are still their most popular. 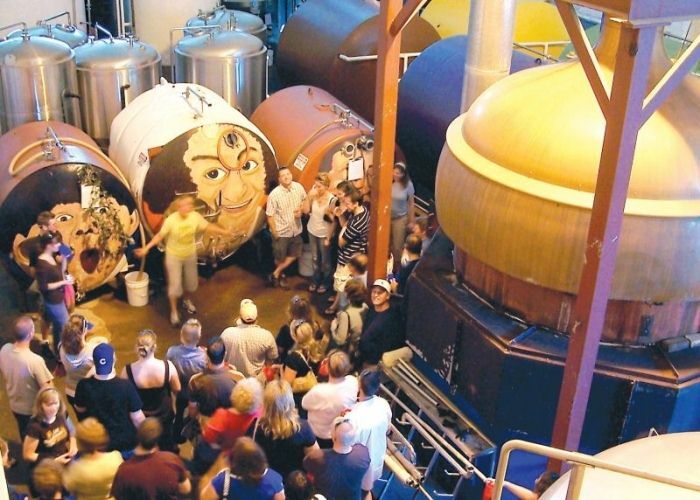 But some of their newer beers have gained national exposure. They produced the first bottled organic beer in the country – E.S.B. – and the first gluten-free beer – New Grist – which is now available in more than 20 states. When Jim was designing a label for the neighborhood’s signature brew, he chose the streetscape along the northern edge of Clarke Street between Fratney and Bremen – a row of trees and houses leading up to the grand steeple of St. Casimir’s. “I thought it was the most prototypical Riverwest street,” he explained. The view is from the corner which now holds the Polish Falcon and the Riverwest Co-op, which used to be a Schlitz tied house. It was a block where when you left the bars, you saw the church, and when you left the church, you saw the bars. “Back in the 70s,” recalled Jim, “I was living downtown near Marquette and didn’t have any direction really. I was living by myself and kinda lonely, then three guys needed a fourth for a flat on Auer. For the first time in my life, I felt a neighborhood, you know, a community.” Even though there’s fewer bars than there used to be, and the role of many of today’s bars is more recreational than before, the old days haven’t completely gone. “In Riverwest,” says Jim, who still lives nearby, you can still walk down to a corner bar.” And once you get there, of course, there’ll be Lakefront on tap.